Lewis McAdam, founder and station director. Radio Larne is to undergo rebranding after securing a full-time FM community radio licence from regulator Ofcom. The station has two years to begin broadcasting on its five-year community licence and plans to launch by January 2020. The local radio team during a roadshow with Asda. Within the next 24 months, it will assume the new name ‘Coast Radio’. However, the service will sound much the same as the current online-based station (www.radiolarne.co.uk), including features like the community diary, news and locally produced shows. 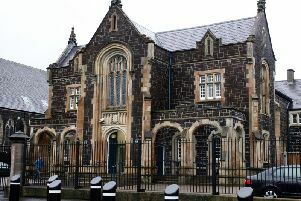 It will, according to the station, offer for the first time a service that is currently not available in the Larne area, one that will be for the benefit of the entire town and surrounding villages. Coast Radio is one of three new community radio licences for Northern Ireland. The others are Coast FM, which will serve students and young people in Coleraine and Bounce FM, which will cover Banbridge. Lewis McAdam, founder and director of Radio Larne, said: “We are delighted that we have been awarded a full-time licence, but now the hard work of getting Coast Radio up and running starts as it will require a significant investment in new equipment, so time will need to be spent applying for the funding to launch the station. “Now that we have the licence we can now work on finalising how the station’s running and set-up costs will be met. “I would like to thank everyone who sent us messages of support over the past few months, as well as the people and businesses that helped us with feedback on our application at the time. Broadcasting online since August 2016, Radio Larne was set up by teenager Lewis McAdam, who has been involved in broadcasting from the age of nine on internet and community-based stations in different areas in the UK. The other members of the Radio Larne team also have many years of experience either in radio or in business.